eXtermination is a free 2D platformer with zombies, lots of them. And weapons such as shotguns, chainsaws and machine guns to send these foul creatures back to where they belong. The player is officer Frank Tayler who has to deal with a zombie apocalypse in the only way anyone can – by shooting them. 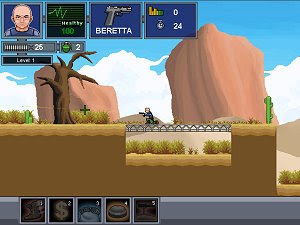 The game includes a story mode and a survival mode and the gameplay can be compared to the likes of Abuse or Facewound, another freeware game for PC. The player uses the keys to control the character and the mouse to control the sight.